UAPD K9 patrol at Walton Arena. FAYETTEVILLE, Ark. – If someone finds a suspicious package on the University of Arkansas campus, the UA Police Department officer called to check it out will have four legs, fur, a highly trained nose and answer to the name of either Leah, Dingo, Orry or Oakley. These are the officers of the UAPD K9 Division, working with their handlers: Sgt. Jeff Shetlar with Leah, Cpl. David Nguyen with Dingo, Cpl. Chris Krodell with Orry, and Ptl. Wesley Copelin with Oakley. Three of the four K9 officers – Leah, Orry and Oakley – are trained to sniff out explosives. 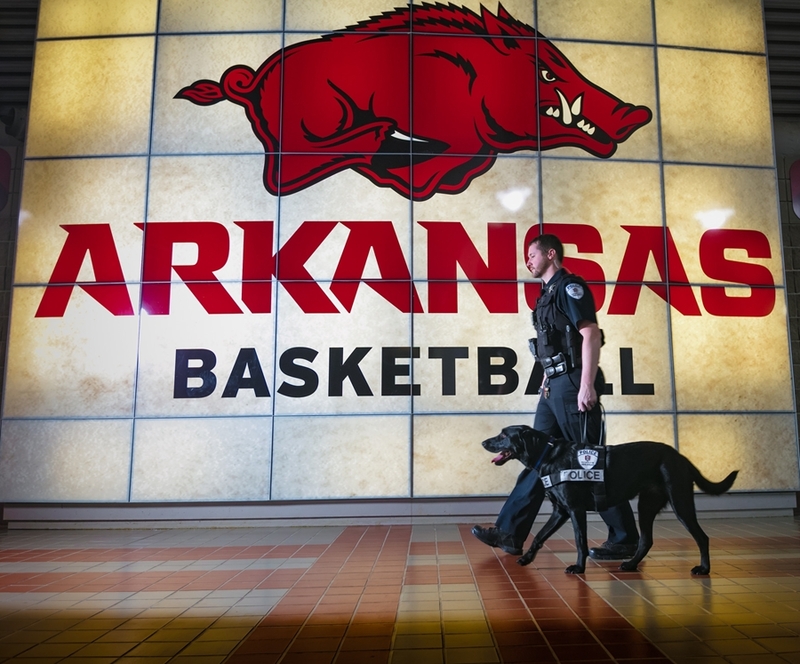 Before each Razorback football or basketball game on campus they are responsible for sweeping Reynolds Razorback Stadium or Walton Arena to be sure the buildings are safe. Leah and Orry are also used on patrol during the games with their handlers, providing extra security. Dingo specializes in finding drugs, but is also used for patrol on game days. The UAPD’s K9 Division was started in 2010 specifically to provide this kind of security service. In fact, the first two dogs, since retired, were purchased and donated by the Athletics Department. The division grew when the UAPD added Dingo, and then bought Leah and Orry to replace the retired dogs. Sgt. Shetlar, who leads the division, donated Oakley to UAPD last year. The tie between the K9 division and the Athletics Department is still strong. The department pays UAPD for the division’s work at games, makes the Tyson Indoor Track building available for weekly training exercises, and helps out in other ways as well. Each of the K9 officers has a distinct personality – which, of course, is also true for each UAPD officer. 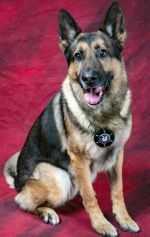 Dingo is an eight-year-old German shepherd, and he has been with the division for 6 years. He’s trained for dual duty: regular patrol on campus with his handler and to find drugs. He’s all business when he’s working, but when Cpl. Nguyen gives him the cue to relax he becomes a big, friendly dog, one of the students’ favorites. Orry also has a reputation as a “friendly one.” He’s a five-year old German shepherd and joined the division three years ago. He is also trained for dual duty: to detect explosives as well as help out on patrol. It’s never a good idea to approach a K9 uninvited, but when Orry is on a break he’s loves the attention he gets from “fans” of all ages. Leah is also five years old. She’s a Dutch shepherd and joined the UAPD about the same time as Orry. She is a particularly high energy dog and loves to play when she isn’t working. She’s not as easy to approach when she’s not working, but she doesn’t mind people petting her once they’ve been properly introduced. Oakley is the rookie of the team. 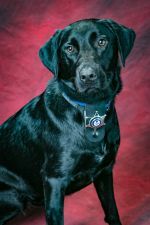 She’s a two-year old Labrador retriever and has been with the UAPD for one year. 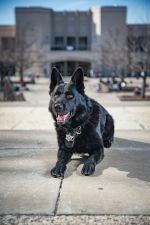 She is trained to search for and find explosives, not for patrol, so she has less interaction with people on campus. All four K9 officers are certified and train every week with their handlers. Orry and Leah are not just certified to work on campus – they have also gone through FBI and U.S. Marshal’s Service training. They’ve been called many times to assist on federal operations. They’re also available to assist law enforcement anywhere in Arkansas – and have – because they are two of only seven “bomb dogs” in the state. Back on campus Orry, Leah and Dingo are familiar to the tens of thousands of Razorback fans who see them on patrol outside the stadium or arena during home football and basketball games. They are also regularly seen on campus, on patrol with their handlers, adding another level of security for students, faculty and staff. They frequently attend the crime prevention talks presented by UAPD officers, where they generally steal the show. And, roughly twice a year, the K9 division officers are called on for one more special duty – Orry and Dingo in particular.